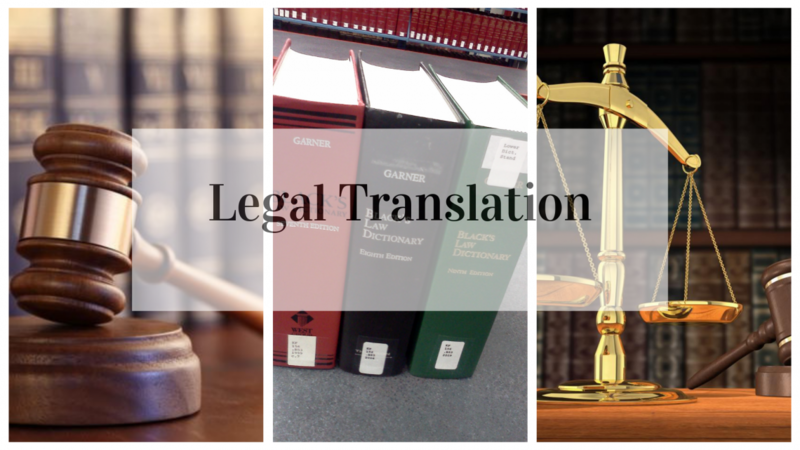 Legal Translation has characteristics and difficulties which are not specific for other specialized fields and this is due to the fusion of social, linguistic, cultural, methodological and theoretical elements that cross this area. Legal translation is not a simple task, because only professional translators specialized in law terminology are really able to translate legal official documents. The mistakes of translation in a passage of a contract or of a will, for instance, could lead to lawsuits and, of course, to loss of money. To prove how difficult is to work with law terminology we will make reference to David Mellinkoff, American jurist, who analyses twenty-two characteristics of legal language in English, a language he sees as full of inaccuracies. Mellinkoff qualifies the language of law as “wordy, unclear, pompous and dull” (131). The result, he notes, is a language which meaning is difficult to understand, not only for the layman but even for a specialist. What does a document mean? S. Briet defined the concept as “any concrete or symbolic indication, preserved or recorded, for reconstructing or for proving a phenomenon, whether physical or mental” (7). What does a legal document mean? According to the dictionary, it is “a document that states some contractual relationship or grants some right” (http://www.thefreedictionary.com/legal+document). Here is the legal definition of ‘documents’ founded in an online English Dictionary: “The deeds, agreements, title papers, letters, receipts, and other written instruments used to prove a fact. Documents is also understood evidence delivered in the forms established by law, of whatever nature such evidence may be, but applied principally to the testimony of witnesses” (http://www.lectlaw.com/def/d188.htm). As we see we deal with a very complex and large domain. Let us analyze each type separately. Formal Public Numeric Documents are documents issued by the State authorities, which concern the entire human community and are expressed in numerical expressions, figures. Examples: economic, law, cultural statistics, etc. ; several administrative acts; census of population, housing and animals; statistical reports; records of financial and economic activities of enterprises etc. Informal Public Numeric Documents comprise information and statistical data, results of previous sociological researchers, tables, graphs, all included in books, magazines, statistical studies, newspapers and other publications. Personal Numeric Documents are acts providing significant information about career development, the quality of life, the social status, etc. Examples of official acts: property deeds, tax, payroll decisions or shift from one salary category to another. Examples of informal acts: family budgets, notes on individual income and expenses, etc. Public Non-Numeric Documents include the specifics of a certain epoch or geographic region. Examples: magazines, newspapers, books (science and belles-lettres), entertainment programs, posters, monographic works. Formal Personal Non-Numeric Documents offer important data about the form of organization of social life,the dynamics of existing social structures, information about individuals and community. Examples: certificates of birth, marriage; identity cards, property deeds, wills etc. Informal Personal Non-Numeric Documents are confidential documents that reflect the individual’s life experience and provide information about customs, traditions, about the society organization, the family, information concerning the financial situation of different social categories. Examples: personal diaries, genealogies of race (which reflect the kinship system for many generations), letters, social biographies. S. Chelcea considers that we must also distinguish official documents which are issued by the State authorities or by the Government and officious documents which are acts expressing a certain official position of some organisms (e.g. Political parties) (Ibidem). acts with no legal effect (acts with organizational,technical, functional character). 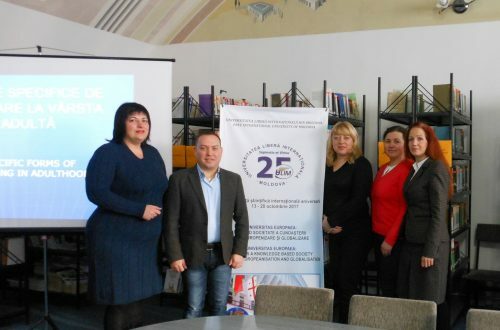 acts of local bodies and public administration – the effects are limited to a particular territorial-administrative unit (acts of local councils, prefects and mayors). documents issued by the economic agents and other companies and institutions. 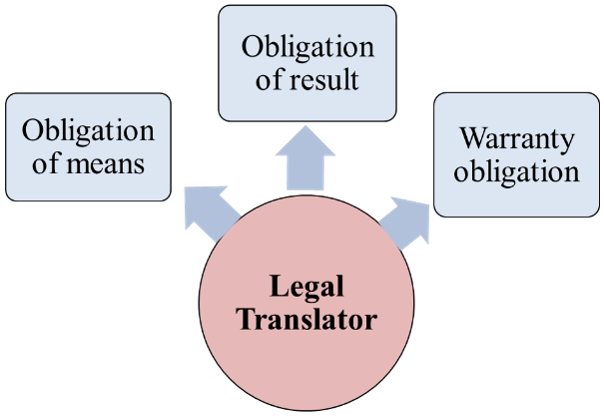 The same scientist distinguishes three types of responsibilities for legal translator: the obligation of means, the obligation of result and the warranty obligation (see Figure nr. 2). In the first case, the author implies tasks the translator should implement fully as well as the linguistic and lingual resources which are almost unlimited. In the second case, the researcher refers to the re-expression of target legal text content, while in the third case, it’s the highest degree of reliability of a translation. Gémar says the translator assumes different degrees of responsibility depending on whether he/she translates documents belonging to the first, second or the third category of legal texts, mentioned above. Thus, when working with acts of public interest the responsibilities of translator are not the same as when working with internal documents or with acts of private interest and differ from the responsibilities of a translator that works mainly with wills and collective conventions. As for legal doctrinal texts, they are perceived by the Gémar as literary texts, as their translation requires special skills. We have seen the variety of official and non-official documents and the criteria of their classification. Now we will try to make some reflections on the difficulties of translation of law terms. Jean-Claude Gémar notes that the real problem of legal texts translation is that we don’t operate with two different languages, but with two different legal systems. According to the scholar, this thing becomes even more evident when two legal systems use the same language, e.g. British and American law systems (Ibidem). This viewpoint is shared also by Ludmila Hometkovski. In her monograph devoted to the Community law terminology (Taxonomia paradigmatică și sintagmatică în terminologia dreptului comunitar), the author states that for transferring correctly the legal meaning, the translator of legal texts must, firstly, have some knowledge of legal subject content. The translator’s ignorance in the field in which he/she translates can lead to bad effects (56). This approach of legal translation specificities explains that besides the knowledge of terminology and mastering languages involved in the translation process, a professional translator must be familiar with the domain and possess epistemological and praxeological skills required for a good translator and the necessary for a qualified terminologist. In this sense, legal translation becomes a “confrontation of different branches of law, even if they are part of the same law system” (Hometkovski 57). It’s important to mention here the interdisciplinary approach of juridical language as part of Jurilinguistics, considered by Gerard Cornu as “an auxiliary of sciences connected to law” (19), pursuing its relations with law history, comparative law, with legal sociology and legal informatics. Currently in Europe,unfortunately not yet in the Republic of Moldova, we have access to law bilingual and multilingual dictionaries, e.g. : Elsevier’s Dictionary of Criminal Science in eight languages​​, compiled by Johann Anton Adler (Amsterdam – London – New York, Princeton, 1960); Jerzy Pienkos, Lexique général des termes de droit, d’économie, de relations internationales et de politique. Vocabulaire systématique de terminologie juridique, économique et politique (Warsaw, 1972); Thomas A. Quemner, Dictionnaire juridique français-anglais (Paris, 1974); Dan Dumitrescu, Dicționar român-englez de termeni juridici, drept comercial și de asigurări (Bucharest, 2004). However, the establishment of a terminological equivalence is one of the key problems of translation. The equivalence typology, as well as the typology of legal texts, differs from one theorist to another. Theorists who define translation in terms of equivalence are numerous. John Cunnison Catford launches the postulate that the translation could be defined as a replacement of textual elements of a language by equivalent elements of another language (27). Eugene Nida believes that translation consists in producing, in the target language, the closest natural equivalent of the message from the source language, on semantic and stylistic levels (158). According to Ubaldo Stecconi, “Equivalence is crucial to translation because it is the unique intertextual relation that only translations, among all conceivable text types, are expected to show […]. Such ‘expectation’ is certainly an affair of social convention rather than empirical certainty, but it has consequences to the actual work of the Translator […]. B had never been equivalent to A before it appeared in a translation: using inferences of the adductive kind, the translator makes the two elements equivalent.” (apud Pym 166). From a pragmatic point of view, the target text should contain elements for establishing an intercultural communication. In Nida’s opinion, “Formal equivalence focuses attention on the message itself, in both form and content. In such a translation one is concerned with such correspondences as […] sentence to sentence, and concept to concept. Viewed from this formal orientation, one is concerned that the message in the receptor language should match as closely as possible the different elements in the source language. This means, for example, that the message in the receptor culture is constantly compared with the message in the source culture to determine standards of accuracy and correctness.” (159). Functional Equivalence, intended only for a certain audience: E.g. Crown Court has a meaning only for a British reader. This technique consists in translating a cultural specificity by another, which instead of clarifying the term acceptance may lead to some confusion for a reader that is not specialist. In French Court d’Assise is practically the equivalent for the English Crown Court, a term that seems to be authentic for Anglophone readers. Other examples: En. Home Secretary – Fr. Ministère de l’Intérieur; En. Lord Chancellor – Fr. Garde des Seaux. This strategy is acceptable for translations addressed to general public, but if translations are made for lawyers they can involve certain risks. Descriptive Translation. The translator always consults specialized terminographic sources in order to find an adequate equivalent, but also its usage in the context to be sure that the mistake was avoided. The equivalent happens to be absent in dictionaries. In this case, the first solution is the descriptive or explanatory translation, the second one is to keep the original term. For example: Ro. contravenții, delicte, crime – Fr. contraventions, délits, crimes – En. minor, major and serious crimes offences. The main draw back of this technique is that it is often difficult to find a concise and unambiguous wording. En. affidavit (written declaration made under oath; a writ-ten statement sworn to be true before someone legally authorized to administer an oath) – Fr. affidavit – Ro. affidavit. Fr. ayant-cause (n.m.) – En. legal successor, successor in title – Ro. persoană fizică sau morală căreia i-au fost transmise drepturile sau obligațiile unei alte persoane. Fr. bailleur (n.m.) – En. lessor – Ro. persoană care dă în chirie. Fr. comparant, -e (n.m.,f.) – En. party appearing in court – Ro. persoană care se înfățișează /se prezintă în fața unei autorități. Fr. expédition (n.f.) – En. exemplified copy – Ro. copie autentică (a unui act). The descriptive translation is very close to the so-called false equivalence. A false equivalent is usually the word which coincides entirely or almost entirely as sonorous aspect with the word from the source language, but which has another meaning. Such words are also named interlinguistic or bilingual homonyms. Due to the fact the sonorous aspect is recognized, both the speakers and the translators sometimes accept very easily the word by giving a foreign meaning. The sonorous coincidences are often absolutely accidental and can generate completely bizarre situations of communication. For example, the English word commodity has the meaning of “a product or a raw material that can be bought and sold, especially between countries” (articol de comerț, marfă) that differs from the Romanian word comoditate. There are also untranslatable terms like Common Law, Law Lords and Lord Chief Justice and terms without equivalent(s) but which have a consecrated translation, for instance Magna Carta (Latin for The Great Charter of the Liberties of England, issued in Latin in the year 1215) – Fr. Grande Charte – Ro. Magna Carta/Marea Cartă a Libertăților, En. Bill of Rights (1689) – Fr. Déclaration des Droits – Ro.Declarația drepturilor. Fr. huissier de justice (n.m.) – En. bailiff – Ro. portărel, executor judecătoresc. The explanation of the last example given by the French-English Dictionary Robert & Collins Super Senior (2000) is very interesting, the explanation proving that we don’t operate only with two different languages, but also with two law systems: “Although in some respect the role of huissiers is similar to that of bailiffs, theirs activities are not identical. The main function of a huissier is to carry out decisions made in the courts, for example evictions for non-payment of rent and seizure of goods following bankruptcy proceedings. Unlike bailiffs, huissiers can also be called upon to witness the signature of important documents, and to ensure that public competitions are judged fairly” (471). The meaning of the term, the context and the peculiarities of the law system are the key aspects the translator should take into account. The English terms to sue and to prosecute which, at first site, seem to be absolute synonyms are translated into French as poursuivre en justice, intenter un procès contre qn., attaquer en justice, into Romanian a intenta un proces, a da în judecată. Only a specialized explanatory dictionary can bring to light the important distinction between these terms. Thus, the verb to sue (bring a civil action against smb.) is used in case of civil proceedings, while to prosecute (bring a criminal action against smb.) can only be used in case of prosecutions, penal proceedings. Fr. détention sans jugement – En. detention without trial – Ro. detenție fără proces de judecată /fără condamnare. 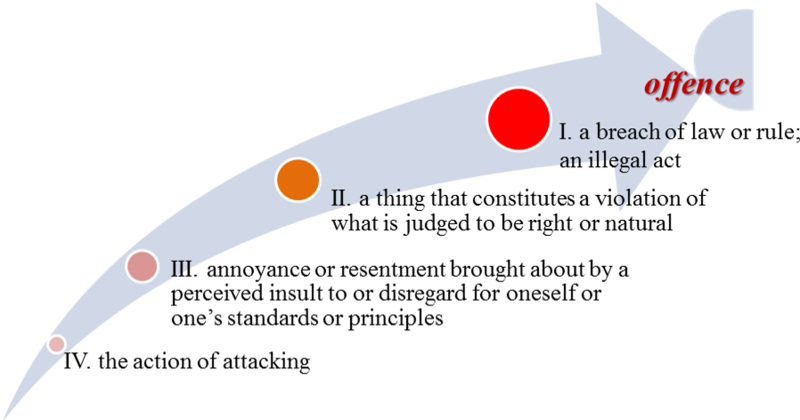 Let us take another example and analyse the semantic structure of the noun offence which could be roughly presented by the scheme below (only the most frequent meanings are given). The scheme suggests that meaning I holds a kind of dominance over the other meanings conveying the concept in the most general way. It is the main meaning, the centre of the semantic structure of the term. The meanings II-IV, which are called second­ary meanings, are associated with special circumstances, as­pects and instances of the same phenomenon. The translation of legal texts requires excellent knowledge of national and foreign law systems, of procedural terms which have often a sacramental character and have no correspondent in common language. The specificities of procedural terms and the polysemantism can lead to translations without a juridical sense: fatto and diritto translated into Romanian by făcut and drepți instead of în fapt and în drept; Clark’s tranlated as Clark (proper noun) instead of secretar; Conseil de Prud’homme from French translated into Romanian as Consiliul lui Prudhomme (proper noun) instead as Secția pentru litigii de muncă and others. The great problem encountered by translator of legal texts, especially of community texts is that they have to translate terms belonging to a large number of fields, and consequently they must have researcher skills which can help them access information and specialized terminologies, whenever necessary. Even if a term belongs to only one domain, it may have two or more equivalents in the target language. For example, the term legal (En.) can be translated in different ways, depending on the words with which it is associated: legal document – document legal, act autentic, valabil; legal entity – persoană juridică; legal owner – proprietar legitim; to institute legal action – a intenta un proces. Child custody – the right of determining the residence, protection, care, and education of a minor child or children, especially in a divorce or separation. Custodie (f) – păstrare sau pază a unor obiecte puse sub sechestru (DEX). Another difficulty of translation is related to proper nouns. Geographical names of regions, municipalities and so on, and dates appearing in the European documents are translated in accordance with the rules in force: Fr. Fait à Bruxelles, le 27 septembre 2001 – En. Done at Brussels, 27 September 2001 – Ro. Adoptată la Bruxelles, 27 septembrie 2001; Fr. La Convention de Berne – En. The Berne Convention – Ro. 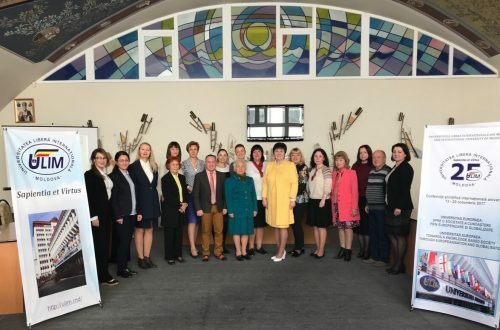 Convenția de la Berna. Proper names of people keep their original form while their functions are translated: Fr. La présidente Nadine Fontaine – En. The President Nadine Fontaine – Ro. Președintele Nadine Fontaine. The feminine form La présidente (Fr.) is translated into Romanian by the masculine Președintele, although according to the dictionary we can also use the feminine Președinta. Specialized text consists largely of specific vocabulary and elements of common vocabulary, so the translator should respect morphological, syntactic, lexical rules of general language, but at the same time be attentive to specific rules of the specialized language. to avoid using terms of national legislation to designate concepts specific to other law systems. The translator’s main task is to create a text that will have the same legal effect in practice. To do so, the translator must be capable to understand not only the meanings of words and sentences, but also what legal effect it is supposed to produce, and how to achieve it in the target language. Translation of law texts from one language into another involves very complex theoretical and practical problems. The specialized translator, alias the juritranslator must have an interdisciplinary comparative approach (law and linguistics) to both legal systems. Briet, Suzanne. Qu’est-ce que la documentation? Paris: Documentaires Industrielles et Techniques, 1951. Catford, John Cunnison. A Linguistic Theory of Translation: An Essay in Applied Linguistics. London: Oxford University Press, 1965. Chelcea, Septimiu. Tehnici de cercetare sociologică. București: SNSPA, 2001. Cornu, Gérard. Linguistique juridique. Paris: Montchrestien, 1990. Gémar, Jean-Claude. « La traduction juridique : art ou technique d’interprétation ? ». In: Meta, Translators’ Journal, vol. 33, no. 2. Montréal: Les Presses de l’Université de Montréal, 1998, p. 304-318. Hometkovski, Ludmila. Taxonomia paradigmatică și sintagmatică în terminologia dreptului comunitar. Chișinău: ULIM, 2012. Le Robert & Collins Super Senior, Grand Dictionnaire français-anglais. Paris : Le Robert, 2000. Mellinkoff, David. The Language of the Law. Boston: Little, Brown and Company, 1963. Nida, Eugene A. Toward a Science of Translating: With Special Reference to Principles and Procedures Involved in Bible Translating. Leiden: E. J. Brill, 1964. Pym, Anthony. “European Translation Studies, Une science qui dérange, and Why Equivalence Needn’t Be a Dirty Word”. In: TTR: traduction, terminologie, rédaction, vol. 8, nr. 1. Montreal: Concordia University, 1995, p. 153-176. 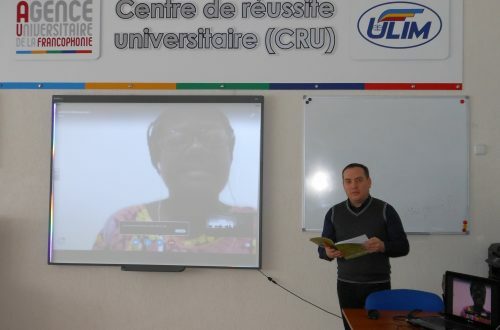 Dicționarul explicativ al limbii române, http://dexonline.ro, visited on 13.03.2012. The Lectric Law Library, http://www.lectlaw.com, visited on 24. 02.2012. The Free Dictionary, http://www.thefreedictionary.com, visited on 12.03.2012.